Europe’s economic crisis is a product of decades of populist policies. This isn’t a currency crisis. Europeans must face up to decades of dishonest politics. 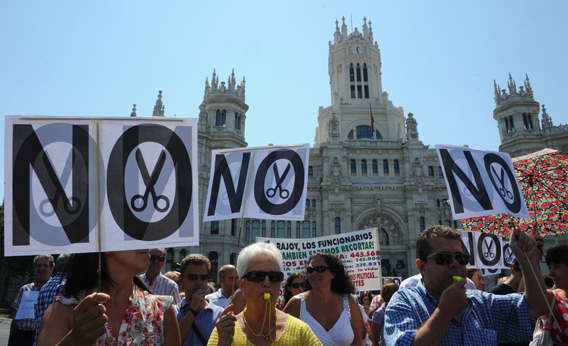 On Thursday, government employees protest Prime Minister Mariano Rajoy’s June 13 announcement of austerity measures to reduce Spain’s deficit. LONDON—Like the bass line in a pop song, the eurozone keeps pumping out bad news, even while the world is distracted by other themes. On a typical day this week—Tuesday, between 8 a.m. and 3 p.m. in Britain —one could learn that Moody’s, the rating agency, had just lowered its outlook on Germany from stable to negative; that there were “alarming signs for Italy in the bond markets”; that Spanish 10-year bond yields had hit a euro-era record high; and that the entire eurozone was suffering from a manufacturing slump. Besides all that, European stock markets had not yet recovered from the previous day’s crash, which had itself been caused by rumors that Spain would soon need a full-scale bailout. Another day, another set of crisis headlines—but there is a silver lining: Finally, Europeans are being forced to face up to decades’ worth of fundamentally dishonest politics. Since the 1970s, one government after the next has spent, borrowed, and then inflated its way out of the subsequent debt. Then they recovered—only to spend, borrow, and inflate once again. Not coincidentally, this cycle was most severe in countries with weaker democracies. Spain ceased to be a dictatorship only after Franco’s death in 1975, Greece was ruled by a military junta from 1967 to 1974, and Italy has had more than 60 governments since World War II. Successive leaders in all of those countries have tried to “buy” the electorate with elaborate pensions, state-sector employment, and other perks. Banks across the continent and around the world have greedily facilitated them. Now they can’t. Though no one knew it at the time, joining the euro was like adopting the gold standard: It meant that individual governments couldn’t inflate their way out of trouble anymore or pass on to the next generation the bill for today’s expenditures—as they still can in the United States and Britain. All along, it has been a mistake to describe the eurozone’s difficulties as a “currency crisis.” In fact, it’s a political crisis, caused by an addiction to debt, and it requires a political solution. Electorates have learned the truth: They are bankrupt. Whatever decisions the European Union now makes, the continent’s future recovery depends on how much of the plain facts ordinary people can bear to absorb. As I wrote a few weeks ago, it’s not clear that the Greeks really understand their situation. Nearly a third of them voted last month for a party that promises, yet again, to create 100,000 state jobs without explaining who will pay for them. Nationalist rumblings about the authoritarian Germans who want Greece to cut its budget in order to remain in the eurozone are also a symptom of delusion: Whoever is lending to Greece, whether Germany or Ghana, would demand evidence of changed behavior. In the past, Spanish politicians often played the blame-someone-else game, too. The former socialist Prime Minister Jose Zapatero was unduly fond of conspiracy theories about the bond markets. Although his conservative successor, Mariano Rajoy, was elected with a large majority and a mandate to make major changes, it’s not clear whether he has the will or the popular support to push them all through. Major demonstrations by public-sector workers last week in Madrid ended with riots and rubber bullets. The Italian leader Mario Monti seems bound and determined to tell citizens the truth, and in his first six weeks in office in the autumn of 2011 he passed more reform measures than Italy had seen in a decade. But since then things have been rockier: This week, Monti put the bankrupt region of Sicily under what almost amounts to compulsory emergency rule. This political unrest is happening after, not before, a series of bailouts, major and minor: These three nations, and their banks, have already received funding that ultimately comes from Germany, the only truly solvent member of the euro zone. They may need more help—but before that, German politicians will have to tell their electorate the truth, too. Which is this: No country has made more money out of the euro than Germany; no other country has profited more from the current crisis—which has kept German borrowing rates relatively low—and no other country’s banks own more of the continent’s debt. Germans aren’t “rescuing” their neighbors out of magnanimity, as many seem to think, but out of self-interest. But does the German public know it? And do the southern Europeans understand how few options they really have? August is the traditional month for financial crises: We may be about to find out.